When emotional abuse is shown in movies or TV programs, the abuser is often a huge, ugly, fierce-looking adult. The abuser never looks like the kind-faced person next door. The abuser is never an ordinary person, never someone known to his neighbors, never someone who shops at the local store, has friends, or keeps a regular job. The abuser is easily to spot. The abuser might as well carry a sign for all people to see. In real life, however, abusers aren’t always that obvious. They might look huge and fierce—but they can also look gentle and meek. In real life, emotional child abusers can be far sneakier. In some cases, no one but the abused child will know the adult is an emotional child abuser. And the weapons used for emotional child abuse don’t rely on strength and bulk; the abuser relies on words and emotional warfare. Though emotional abuse does include outright screaming (called terrorizing), people who watch such movies or TV programs may think, “Oh, I yell at my kid sometimes. Who doesn’t?” What they fail to realize is that—unlike normal bursts of temper—emotional abuse is long-term… and the shouting is part of a long series of shouts. How emotionally abusive parents tear at the child’s sense of self varies. Here are some examples of the different types of emotional child abuse. The abusive parent will withhold attention and affection until the child caves in and apologizes for whatever the abuser perceived as a slight or insult. Through a series of silent treatments, the abused child will learn to be silent, to be docile, to never speak against the parent—because if the child does, he will not be loved or spoken to or even acknowledged as a human being. In emotional child abuse, children are placed in pecking order. A parent continually compares his child to another (a sibling, a neighbor’s child, anyone who is a peer to the emotionally abused child) … and the abuser will always find his child to be lacking. The ranking can be for anything as sitting still during dinner to doing chores; anything is cause for comparison. The abused child will never rank high. Never. Abusive parents treat their children as if the kids are beneath them. This type of abuse destroys something that the child cherishes. Whatever the child treasures, an abusive parent will take away or destroy. Abusive parents will play mind games with their children. It involves saying or doing something then pretending it never happened or happened differently from how it really happened. Parents will say or do things then deny them or change the details consistently, so the child ends up doubting his or her memory. The parents will often also set up the child as being mentally deficient or “fragile,” so that other people who know the child will think that the child is either lying or incapable of recalling things correctly. Again, the abuse is a lifelong campaign, a consistent theme in the child’s life. Often, the emotional child abuser will encourage, through his or her actions and treatment of the scapegoat, the other children to also pick on the scapegoat, so that the scapegoat has no allies in the family. An emotional child abuser will sabotage a child’s calm and peace. For example, if a child looks forward to a television program, at the last minute, the emotional child abuser may deliberately set forth a ridiculously long chore list to be done before the child can watch the show. 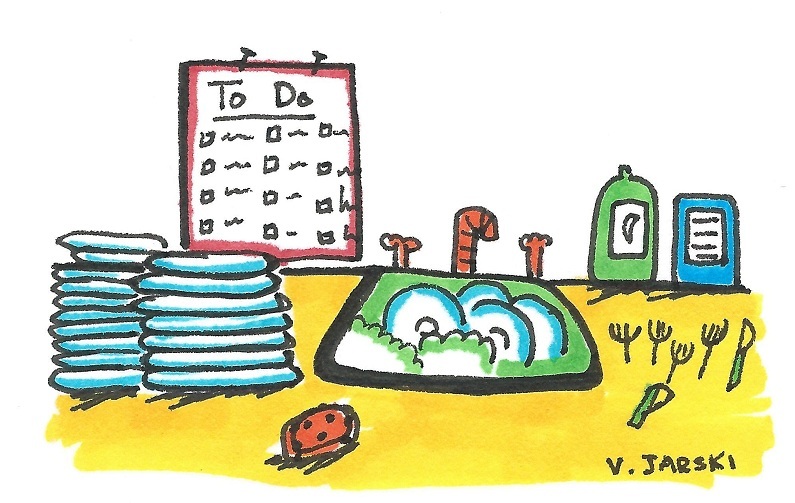 (Think of the evil stepmother in “Cinderella,” who set up Cinderella to fail by giving her too long a list of items to do before the ball.) Or the father will deliberately schedule a family meeting at the same time that a child had planned ahead of time to attend a friend’s birthday party. Like all forms of emotional child abuse, sabotaging ruins a child’s sense of security. The opposite side of scapegoating is favoritism. An example of favoritism is when an emotional child abuser will let one child get a car ride to school with friends, but the other child must walk or ride a bicycle to school even though that child also was offered a ride by friends. Or one child has a completely different set of rules to adhere to while the other child has less or more relaxed rules. An emotionally abuse parent will maintain a sense of power of his children by creating conflict between them. The children will be manipulated into conflicts with one another. For example, a father will talk to Child A about Child B and say how he is upset with Child B because Child B said some terrible things about Child A. Child A will then be angry with Child B for both hurting her feelings and also for making the father sad. Child A and Child B will rarely discuss the incident because the parent has set up the children to distrust one another. Another example: a mother will vent her feelings about Child D to Child E, describing that child as taxing and irritating and whiny… then Child D will start viewing Child E in that light. Child D trusts the parent and will take her side. Meanwhile, the parent will talk to Child E about Child D.
An emotional child abuser will often lie to his child. The lying will often go hand in hand with gaslighting, so that the parent will deny the lie. For example, a parent will tell a child, “If you get straight A’s this quarter, I will buy you an iPod Touch.” When the child gets straight A’s, the parent will deny the statement. “I never promised you an iPod Touch!” The combination of the lie and then the outright denial, if it’s habitual and consistent, will cause the child to begin to question his memory and, in some cases, sanity. The child becomes increasingly self-doubting. Smear campaigners carefully and strategically use lies, exaggerations, suspicions and false accusations to try destroying your credibility. They hide behind a cloak of upstanding heroism and feigned innocence in an attempt to make as many people as possible think their efforts are based not on their vindictiveness, but on upstanding concern. Because emotional child abusers wage lifelong campaigns against a child, a smear campaign often begins in a child’s early years and throughout the child’s adolescence and even into adulthood. For example, an emotional child abuser will emotionally abuse a child then tell his friends that his child is “overly sensitive” and “prone to exaggerate.” Even if the abuse is terrible and obvious, the parent will downplay it to the child, telling the child that he is “overly sensitive” and “prone to exaggerate.” Whenever possible, the emotional child abuser will refer to that child as “overly sensitive” and “prone to exaggerate.” Friends, relatives, neighbors and, in some cases, siblings, will begin forming that perception of the abused child. Because the abusive parent has set up that child to be seen in that light, the abused child will often have no one to turn to for support or help… and if they do, they are not believed and told that they have always been “overly sensitive” and “prone to exaggeration.” Worst of all, the emotionally abused child will be conditioned to take abuse but not speak up or expect anything better because they view themselves as “overly sensitive” and “prone to exaggeration”—though if they related the facts of the events to an outsider (who has not been conditioned for years), the outsider would see the obvious abuse. Note: The types below were mentioned in the Emotional Abuse Defined post. Ignoring. Parents ignore the significant events in the child’s life. They ignore the child in general and refuse to discuss any interests or activities that the child may have. They seem bothered by the existence of the child. The abusive parent will cut short conversations, interrupt the child, mock the child for his/her interests, and treat the child as if she is a nuisance. Corrupting. Parents teach the abused child to be a racist and bigot. They encourage violence and anger, and they advocate bullying. The parents reward the child for substance abuse or bigotry; promote illegal activities; and/or reward the child for such behaviors as lying, stealing, etc. Terrorizing. This behavior is what people first think about when they think of emotional child abuse. Parents threaten the child verbally; they yell, scream, or curse. The parents swing from rage to warmth to rage, ridicule the child, and/or force the child to watch inhumane acts. The abusive parent keeps the child on edge, jumpy, nervous about meltdown. Emotionally abused children often end up extremely attuned to the parents’ tone of voice, slightest movements, nonverbal cues, in order to try to avoid a blow-up. Isolating. Parents leave the child unattended for very long periods of time. They keep the child away from family, friends, and peers, etc. They punish the child for engaging in normal activities and make the child become a misfit. They force the child to do excessive chores or excessive studying to keep them isolated. The child will not have the same opportunities as his or her peers to engage in social interactions but be forced to constantly sacrifice his childhood for the sake of the parents’ demands. Inappropriate control. 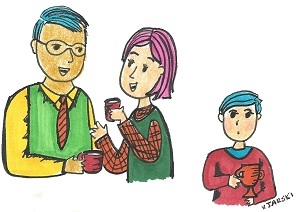 Parents exercise overcontrol—which robs children of the opportunities for self-assertion and self-development. Or parents show a lack of control—which puts children in dangerous situations or at risk to be in them. Or parents show inconsistent control—which leaves the children feeling anxious and confused. Just waking up to the fact you had an emotionally abusive childhood? This 92-page PDF can help you during this difficult time. 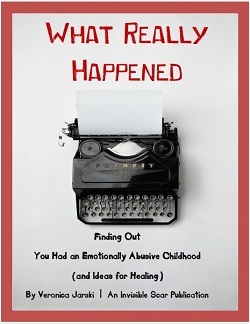 For just $7.99, you receive What Really Happened: Finding Out You Had an Emotionally Abusive Childhood (and Tips for Healing). Veronica Jarski is founder and managing editor of The Invisible Scar, a passion project dedicated to raising awareness of emotional child abuse and its effects on adult survivors. She has extensive editorial experience and a bachelor’s degree in journalism. Her work has been featured on myriad publications, such as Kapost, MarketingProfs, and Ragan. I have faced a lot of these and gave a try after two years the last couple of weeks and saw that my wife and daughter had to suffer as well. At this time, I have decided to move away from this. I got very emotional when I have decided to say good-bye to this. This writing has made me feel good about myself. Thanks a lot! I am 25 years old and I have a brother who is 10. He is currently being raised by my mother, sister, and sister’s bf. My mother was emotionally, mentally, and physically abusive to me for many years. My sister was emotionally and mentally abused after I left the house (but she is now like her). My brother I believe from what I’ve seen is mentally abused and manipulated. He behaves like her and is rude and disrespectful to our father (he separated from our mom about 2 years ago). My father tried to see him when he has his visits but my mother is always interfering, allowing my brother to talk crap to our father, and making excuses as to why my dad isn’t fit. I want to let my brother know that I will always be around if he needs anything so he doesn’t feel he can only rely on the toxic people that are raising him. What can I do to show this because he is sometimes rude to me or doesn’t want to talk. Any tips would be appreciated! I’m 30 and I can’t remember a time when my father wouldn’t scream at me for things that weren’t really important. I cry every time he just as much as raises his voice still, even after I moved out. The last time he really screamed I was sick and had to throw up. I still cry every time when I read something about emotional abuse and I don’t even know why. Normally I don’t let my feelings get to me that way. For me the hardest part are my own contradictory feelings. I hate him, for all the hurt that he caused me, I hate him because I flinch every time someone (especially men) raises their voice and because I have major depressive disorder and self harmed in my teenage years, I think at the time I just wanted to take a bit of that hurt I felt inside and somehow but it outside. A manifestation of my pain, even if I made these scars myself, I feel lile it is still partly his fault. But even though he did all that, I feel indebted to him. I never suffert poverty and sometimes he would be warm and friendly and buy me things, which only made it harder when he lashed out again. I strongly connected to the part about being atuned to little signs. I can always tell when he’s about to burst but sometimes his mood did swing so swiftly that I had to live on edge constantly, when I still lived home. It really took me a long time to understand that what I suffert abuse too. When I was younger I would always tell myself that others had it worse, other parents hit their children and nearly every parent had screamed sometimes in their life. I always told myself that wothout realizing what deep scars this treatment left inside of me. The only thing I am thankfull for is that I am not on the same path my father is. I never raise my voice, I never insult others because in my head there is always that image of his red, sweaty face calling me names or telling me that I am a disappointment and I don’t deserve to be his daughter. I swore to myself, that I would never never do that to someone else. I swore to myself that I woild not become him and till now I managed. I hope that I can comtinues this path of grow.